Ayjah Lighthouse in Sur and its reflexion in the calm water of Ayjah Bay below a blue sky illuminated by warm morning light. 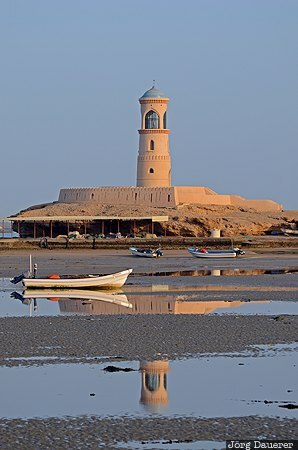 Sur is in Ash Sharqiyah at the coast of the Gulf of Oman in the Sultanate of Oman. This photo was taken in the morning of a sunny day in March of 2012. This photo is part of the exhibition Lighthouses (February 2010). This photo was taken with a digital camera.